Something old, something new, something borrowed, nothing blue – all that, and yet the Infiniti Q60 marries all those items into a pretty cool package. Nothing blue – the Q60 is as red-blooded as a good sports coupe should be. On paper, this car looked like an overweight price leader with just enough power to get it moving – especially when it measures up as at least 150kg heavier than its main German competitors. But, don’t just accept the numbers on the spec sheet. 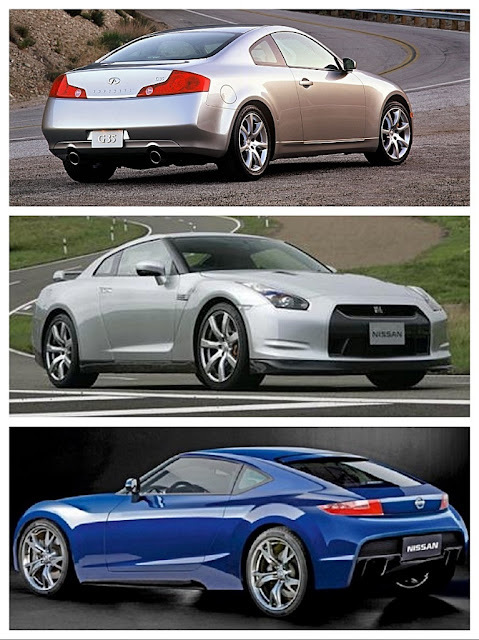 Behind the wheel the Infiniti Q60 could join the trio of sports coupes which make up my personal Gold Standard. 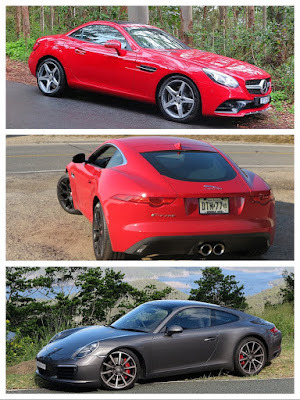 Over the past year or so I’ve compressed my sporty coupe test drives down to a short list of three cars, which are now my Gold Standard reference trio. First is the excellent Mercedes-Benz 300SLC, which marries the same engine fitted to the Q60, with some very Teutonic build quality and great handling. Then there’s the Jaguar F-type coupe, which ensured my driving experience on Cape Cod was truly enjoyable, matching exhilarating handling with impressive power from the supercharged V6. And, last but certainly not least the Porsche 911 Carrera S.
In my mind that’s about as perfect as it gets, albeit with a pricetag which would need a lottery win for me to park it in my garage. But, back to the Infiniti Q60. Based on the specs I feared a ho-hum few days behind the wheel, and a ‘well-it-wasn’t-so-bad’ review. No, no, no! I truly enjoyed the experience. 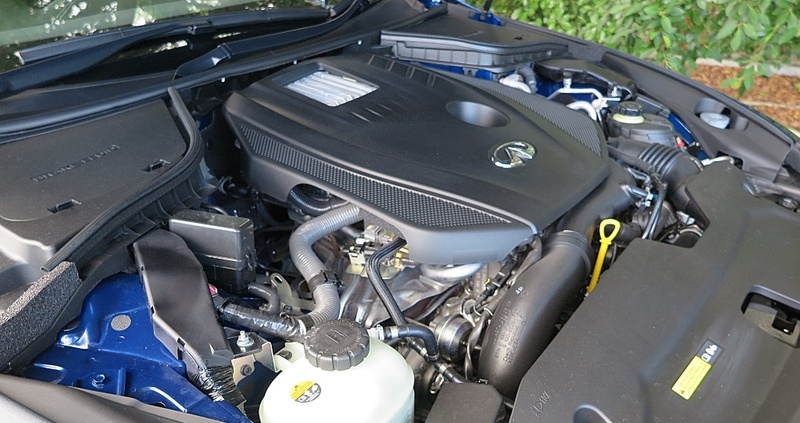 The turbo 2.0L four cylinder engine used in both the Infiniti Q30; and the Mercedes-Benz SLC 300, was very responsive, with more than enough urge. 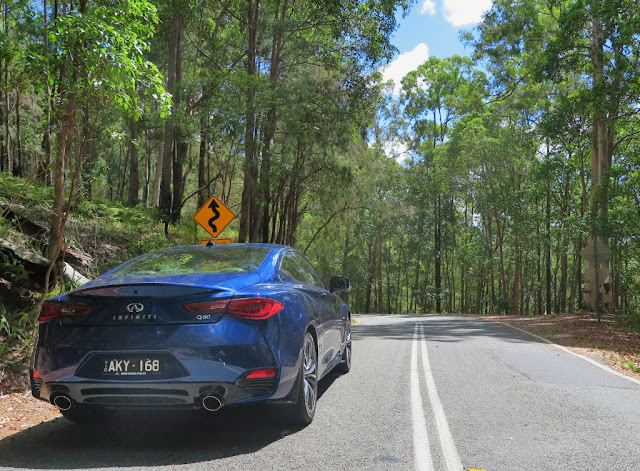 When matched to the outstanding M-B 7-speed (torque converter) automatic transmission, it provided a very spirited driving experience on my favourite Hinterland roads out back of the Gold Coast. 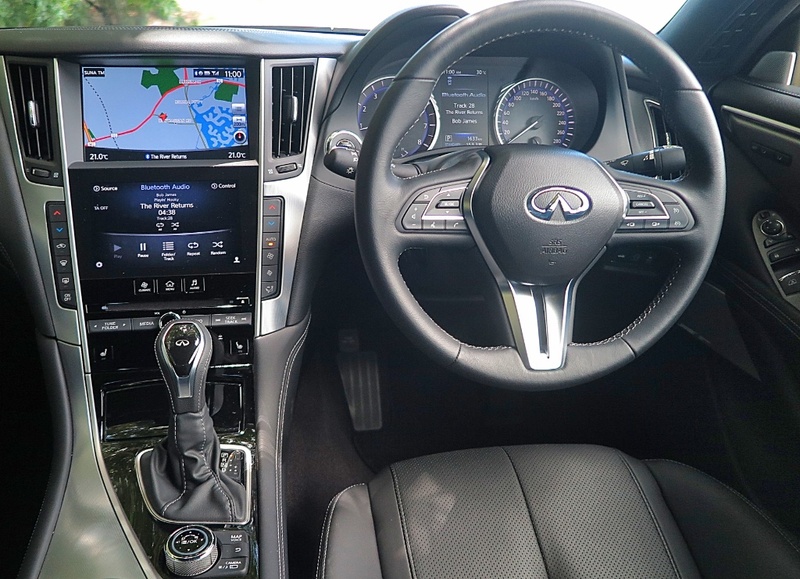 The Q60 perfectly marries the impressive powertrain performance to a very well-sorted chassis and suspension, resulting in a very comfortable touring coupe, delivering both comfortable motoring at sedate suburban speeds, but also agility and precision when you’re going quicker. I’m not big on writing road tests in Driving & Life, but rather I like to look at the brand values, model positioning and market share. However, the Q60 was a real surprise and delight expeience. On the marketing front, I still can’t decide whether Nissan should continue losing money on prosecuting the Infiniti strategy. 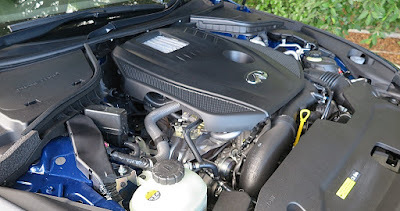 In my opinion Nissan isn’t as committed to its ‘luxury’ brand, as Toyota is to Lexus, and yet despite the borrowed powertrains, and loads of Nissan switchgear and trim features, both the Q60, and my recent experience in the Q30 suggests that given some pumped-up marketing budgets, Infiniti might just bring in some revenue – eventually. 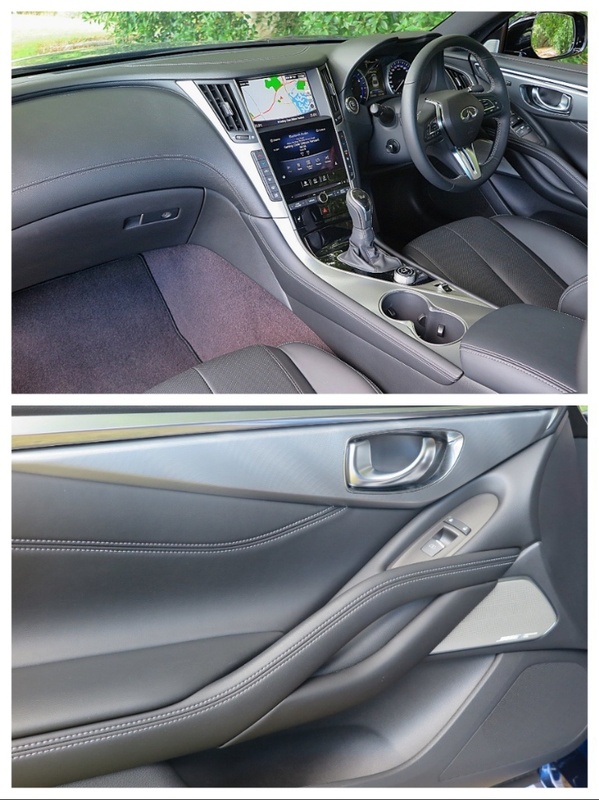 The interior of the Q60 is beautifully designed and trimmed, acknowledging the premium price the Infiniti brand commands. However, once again the combination of the central driver information screen; and the infotainment screen; and the data panel between the tacho/speedo are marvelously independent and complex, badly designed, poorly executed and just plain confusing. Some car companies need to spend more time (and lots more money) making sure they can properly integrate their info/media/phone systems into one easy-to-use, intuitive system and single screen. In this regard, I give a big tick to Jaguar and Audi. Recently I drove a test car which had the ‘clock’ appearing on three separate screens! None were centrally-controlled, so they all had to be adjusted individually. It’s like the systems were designed by three different teams – who never communicated with each other! However, although I get upset by badly-executed multiple screens, the Bose sound system was impressive; the seats were outstandingly comfortable and supportive; and the noise levels and NVH were impressively damped. Speaking of damping, I think that the Q60’s overweight specs may deliver a benefit, because combined with the well-sorted suspension, the damping effect of the (relatively) heavier body smoothed out the ride, and gave a high level of confidence on turn-in. 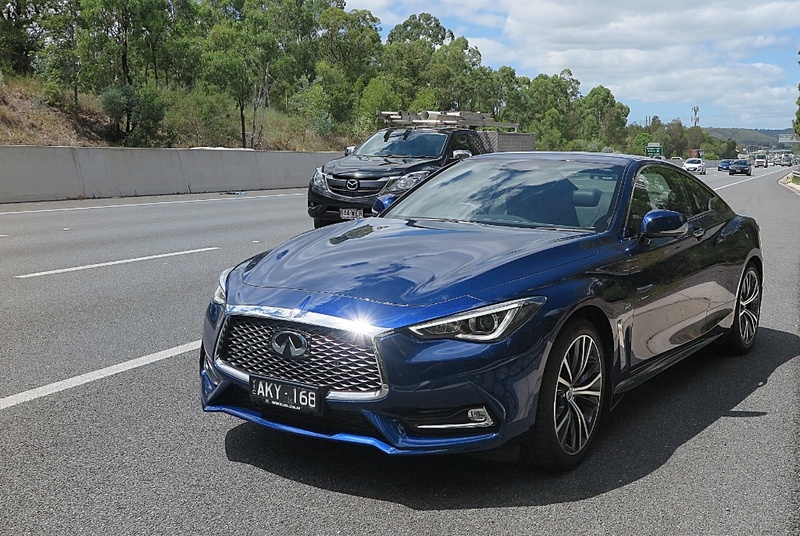 Yes, I liked the Infiniti Q60, and at AUD$62,000 I think it’s good value for money. If you were in the market for this class of car, then you should have a test drive, along with its competitors. I’d be surprised if you weren’t impressed.